Who will address water issues? Will Lower Santa Fe, springs get a life preserver? Did life-triggering phosphorus come from outer space ? How long will Floridians accept environmental decline ? Will lawsuit flush secret billboard deal into the light? Is a new inlet the answer for Indian River Lagoon ? 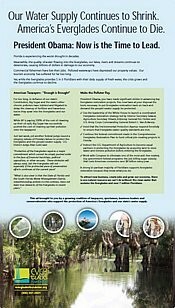 What spending counts as conservation spending ?